In 2002. that's when I visited Kefalonia with my friends. Summer of 2002, nearly one year after "Captain Corelli's Mandolin" with Nicolas Cage and Penelope Cruz had come out in the movies. That movie, based on the book with the same title, was shot in this beautiful island, so you can imagine why my friends suddenly decided they wanted to visit it so badly. That year was really a big one for Kefalonia. The movie had done the island justice and tourists and Greeks had run to find rooms to rent. We were lucky. See, my uncle (my mom's brother) has a house there and he gave us the keys. Anyway, the point is the island was quite crowded, but still we managed to enjoy it. I have to warn you, Kefalonia is always crowded. Here's an example of how much people love it: there's a government program every summer, free tickets to the Greek islands along with accommodation for some groups of Greeks. Well, Kefalonia is always if not the first, the second or third island to run out of tickets. That says it all, doesn't it? 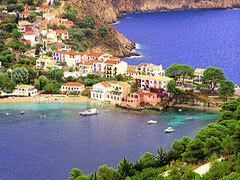 If you search for accommodation in Kefalonia I recommend you to visit Kefalonia Hotel Online Bookings. There, you can make your reservations directly to the hotels and find rooms in low prices and useful guest reviews. Traditional architecture, beautiful houses and unmatched serenity. It's not your imagination, in Kefalonia there are sheep with golden teeth! The house of the spirit which comforts the troubled hearts. 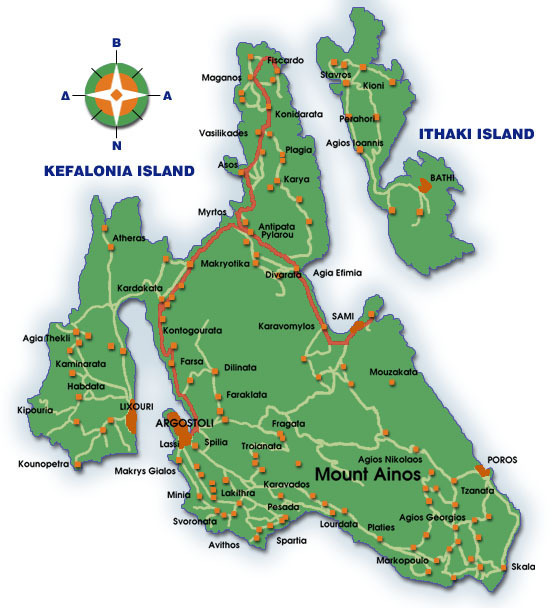 So, what does Kefalonia look like? Rugged, towering mountains, pretty villages and some great beaches: that's what Kefalonia is pretty much about. It used to be an island with Venetian influences and traditional architecture, until it was all shatter ed by the earthquake of 1953. Three are Kefalonia's basic cities. First of all, there's Argostoli. Argostoli was not restored to its former Venetian splendour after the 1953 earthquake, but It's still a quite pretty capital. Sami is the main port of Kefalonia and it was also devastated by the earthquake. Its buildings are mostly undistinguished but it has a pretty setting. As for Assos, it's a gem of whitewashed and pastel houses. It was destroyed as well, but it was restored with the help of a donation from the city of Paris. Which places should I not miss in Kefalonia? Well, I'm going to start with the museums, as I usually do. 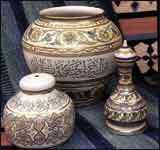 Three are the museums I believe you should not miss in Kefalonia. 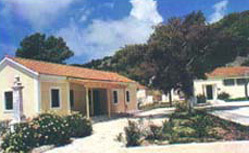 The first one is Argostoli's Archaeological Museum. Situated under Kefalonia's first theatre, this beautiful museum displays a collection of island relics, including Mycenaean finds from tombs (bronze swords, vases with spirals, gold and ivory jewelry), coins from the four ancient cities of Kefalonia and a modern bronze bust of a man from the early 3rd century AD. Then there's the Korgialenio History and Folklore Museum, which exhibits a collection of traditional costumes, furniture and tools, items that belonged to British occupiers and photographs of pre- and post-earthquake Argostoli. It's truly one of the best of its kind. Finally, there's the Museum of Natural History of Kefalonia and Ithaca, with educational exhibits and a library. Other than the museums, Kefalonia has two breathtaking Caves that are a must. 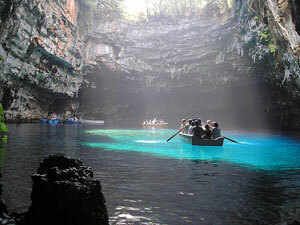 Melissani Cave is a subterranean sea-water lake. When the sun is over-head its rays shine though an opening in the cave ceiling, offering you a dream-like picture. As for Drogarati Cave, it's definitely worth a visit due to its impressive stalactites. Don't forget to pay a visit to the beautiful village of Fiskardo. Fiskardo is the only Kefalonian village that was not devastated by the 1953 earthquake. It is an excellent place with fine Venetian buildings, which is also quite popular with yachties. Are there any archaeological or historical sites in Kefalonia? Well, seeing as I am a castles person, I'm going to start with Kastro of Agios Georgios, a beautiful Venetian Castle just north of Peratata. This Castle served as the capital of Kefalonia from 1500 until 1757. It's polygonal and has three ramparts and the view from the top is simply magnificent. Then there's Ancient Krani, located at the southern end of Koutavos Lagoon, near Argostoli. This site basically consists of the ruins of ancient buildings and walls dating from the 6th or 7th century BC, along with the remains of a Doric temple of Demeter. Ancient Pali is located on the northern side of Lixouri. It was most likely a colony of ancient Corinth. Coins that were found there show the head of Persephone, Pegasus and Cephalus (from whom the island actually took its name). 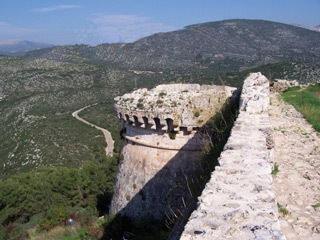 The ancient city of Pronnoi is located northeast of the town of Pastra. That's where you will find Paliokastro (=old castle), as the locals call it, an imposing triangular mound. 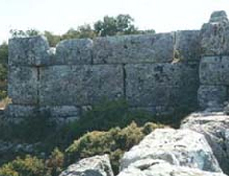 You will also find remnants of the walls of the twin acropolis of Pronnoi. I find that it is necessary for a tourist such as myself to visit some of the traditional villages of the island in order to get in touch with their traditions, see how the villagers act in their everyday lives, observe their reactions and have a closer look at the history of each village. Here are some of my findings that you may find useful if you decide to follow my steps. 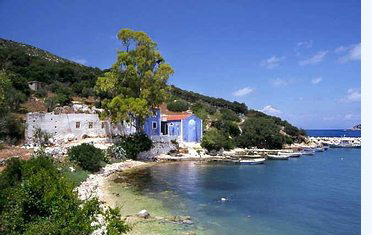 Since Kefalonia is full of such traditional villages you will have some trouble picking among them. 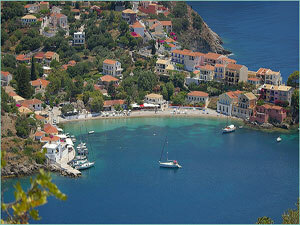 For more information visit my page Kefalonia Traditional Villages. 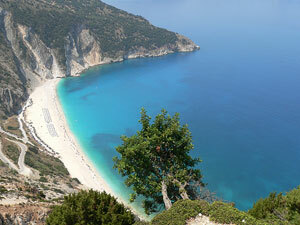 What about the beaches of Kefalonia? As I mentioned somewhere above, one of the reasons why Kefalonia is so popular is its beautiful beaches. Here are some of my own personal preferences. Eblisi, Kaminakia, Foki, Alaties, Agia Ierousalim, Akrotiri Dafnoudi, Katelimata, Myrtos, Harakas, Agia Evfimia, Agia Kiriaki, Agios Spyridon (Atheras), Agios Thomas. 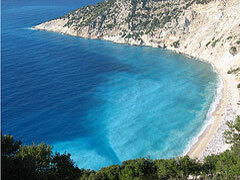 For extended information on the beaches of the island visit my page Kefalonia Beaches. 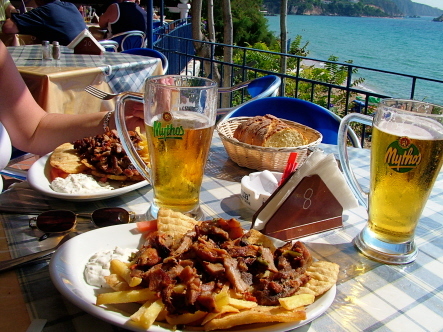 Where should I eat in Kefalonia? Argostoli is the place to go when you want to eat in Kefalonia. All of the good restaurants are gathered there. For example, Captain's Table by Plateia Vallianou is an upscale and "nautical" restaurant with live music. The meat dishes are rather delicious and significantly less pricy than the fish. There's Casa Grec, on Metaxas Street, definitely the best place for dinner on the island. Its dishes range from cordon bleu chicken to Caesar salad and shrimp and it has a quite attractive setting, with a beautiful courtyard. Indian Queen on Lavranga Street is a hot and spicy kind of restaurant, if you get what I mean. Run by a British family, it has a wide selection of Asian dishes and the setting is Oriental. Mythos on Rizospaston Street is another excellent restaurant, with some delicious international and Greek dishes like panzeta in vinegar, honey and thyme (definitely try that one). Patsouras on Metaxas Street, opposite the Sailing Club, is a long-established restaurant, popular for its local meat dishes. Tasia is so well known that it is very difficult to find a table if you want to give it a try you will find her at the port of Fiskardo. The same happens in Vassos and Veggera. To the other part of the port you can find Nikolas, a restaurant with a cool courtyard and a great view. Nightlife may not be the thing that Kefalonia is known about, but that doesn't mean it's not wild. You will not be disappointed by what you'll find. Most of the bars are gathered in Argostolio, even though there are a couple of good ones scattered around the rest of the island. Pikiona Music Bar for example, is a beautiful bar with an idyllic garden and a swimming pool. You can enjoy a poolside drink, a cocktail or a fresh fruit juice; you can even have a midnight swim, under the stars! The music is quite good as well. Zanza Bar is open every day and night from 9 in the morning. Situated close to the beach, it has a great view. You can sit and cool off at the bar or simply jump up and down having the time of your life! 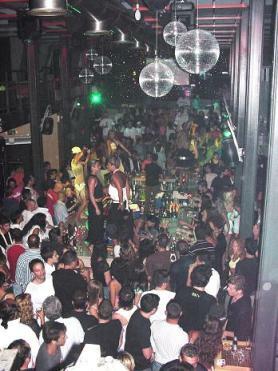 If you want to dance a lot, you have to visit two of the clubs in Kefalonia. The one is Cinema Music Bar, right in the heart of town. As for the other one, it's Stavento Bar, by the beach. Both have excellent, up-beat music and a wonderful setting. There are ferries sailing from Patra to Sami on a daily basis and the duration of the trip is 3,5 hours. If you want more information contact the Port Police of Patra tel. 2610-341002. You can also catch the ferry from Kyllini if you want to reach the port of Poros. The trip duration is two hours and in case you have any questions the port police of Kyllini will be happy to help you if you call them tel. +30 26230-92211. There are also frequent itineraries from Astakos (Aitoloakarnania) to Sami. For information call the port police of Astakos tel. +30 26460-41052. A small ferry sails from Vasiliki in Lefkada and reaches the port of Ithaki, then Fiskardo and finally Zakinthos.